There's a saying, the more things change, the more they stay the same. On April 1, 1908 John Fowler was appointed postmaster in the town we know today as Wallacia. That appointment formalised a commitment to community service and dedication to his town that would be proudly continued by his descendents for the next century and beyond. Today, we are commemorating that service by marking 100 years of outstanding commitment to the local community by the Fowler family. John Fowler came from a Post Office family - his mother Elizabeth had been Post Mistress at Mulgoa for many years. A widow with 14 children, Elizabeth and her family ran the Mulgoa Post Office between 1877 and 1892 and again from 1901-1907. 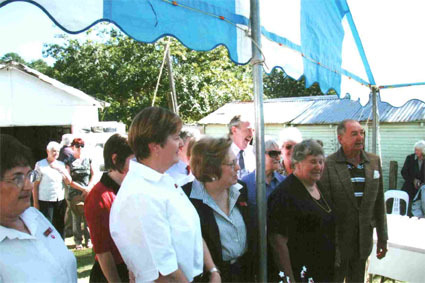 John was highly regarded in Wallacia and served on numerous community boards and committees. He was also an alderman on Mulgoa Municipal Council and as Postmaster ran the general store and manual telephone exchange as well as the post office, his own cattle business and riding school. John was one of the main proponents of the name Wallacia and this is just one of many cases where John Fowler's name dots the pages of local history. In 1908 Wallacia was a popular tourist destination for Sydney residents, with six guesthouses within a mile of the Post Office and this number increased until the 1940s. To say the Post Office and telephone exchange was the hub of the community is probably understating things. Upon his death, the obituary for John in the Nepean Times probably says it best: "For many years there was no local movement which did not receive inspiration and help from John Fowler. He was active and earnest, and gave of his time and substance to the public good." He obviously passed on those qualities to his son and grandson and they met and married women of equal moral fortitude and commitment to civic duty. John's own wife Ethel Mary had been his assistant in the Post Office as well as raising their 10 children. While all the Fowler children helped in the business, by the late 1930s the responsibility of the post office fell mainly to Bernie where he came to know an operator on the Camden telephone exchange, Marjorie Parsons. In May 1940 Bernie and Marjorie were married. A few months later Bernie shipped out for the Middle East and like many women taking on their husband's roles, Marj, along with John, was responsible for the telephone exchange and post office - a job all the more important at this time with families desperate to hear news from the front. When he came home, Bernie took over officially as postmaster from his father in 1946 and the Post Office and telephone exchange relocated to its present site in 1954. Bernie and Marj raised their family in the home at the rear of the post office. I know Ross and later, Margaret can recall many a family meal being interrupted by the ringing of the phone, it was all part of the job. 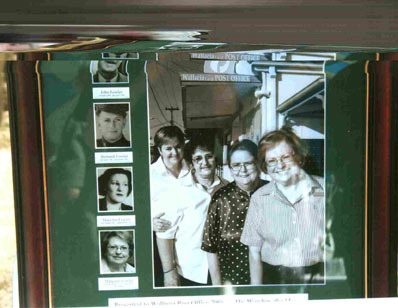 Marj took over the running of the Post Office officially when Bernie died in 1981 and until she retired as Post Mistress in 1993, had devoted 53 years of continuous service to the Wallacia community. Bernie of course, had also held the position I hold today, as Mayor of Penrith - so not only did he serve Wallacia but he also made a significant contribution to the broader City of Penrith, with Marj by his side. Of course, the story doesn't end there as Bernard's son Ross is today one of my councillor colleagues and himself a former Mayor of Penrith while his wife Margaret has been Postmaster since taking over from Marj in 1993. 10 decades of community service from the Fowler family! The Fowler men and women have given so much to the local area and this impressive achievement is well worthy of recognition. It's an honour and a pleasure to present to Margaret Fowler this frame depicting the Fowler Post Masters over the past 100 years, alongside the friendly staff you see in the Post Office today. Presented to Wallacia Post Office 2008, by His Worship, the Mayor of Penrith, Cr Greg Davies, to commemorate 100 years of service to the Wallacia Community by the Fowler Family. Elaine Crossman and Reg Blattman surrounded by current & former Wallacia Post Office staff listening to the Mayoral Commemorative Address.